Here’s a clever and contemporary take on an old school guest book or group card and a gift in itself no less. Perfect for a baby shower, a birthday or a christening, the Wish Jar lets you bottle up all of those sentimental well wishes from your guests in one sweet package – a mason jar! 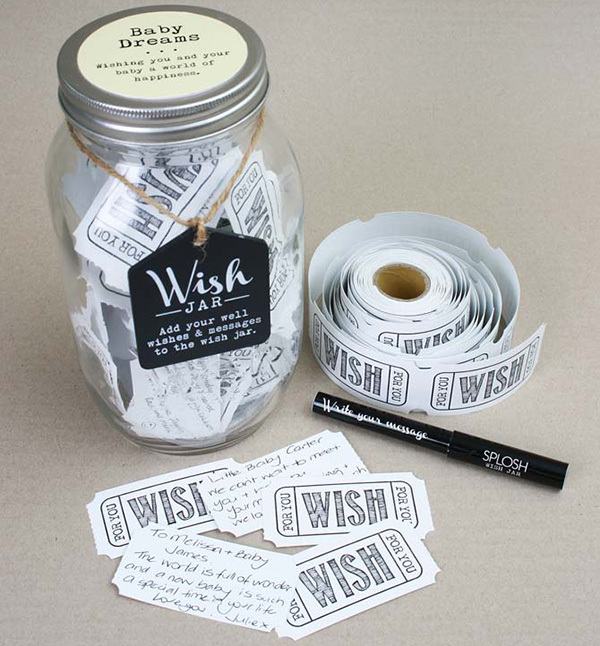 The Wish Jar includes everything you need to mark your special occasion and gather sentiments from your guests. Included is a large 20 centimetre tall glass Mason jar with a super cute wooden swing tag, 100 paper tickets and a black wish pen. There are four different Wish Jars available – Baby Dreams, Wishes and Happy Birthday in pink and blue. Be sure to head to Urban Baby before your next party, where you can pick your own Wish Jar for just $19.95.